I’ve just returned from fieldwork at Ghar Dalam Cave, Malta. This is one of my favourite places, and I’ve been working there and collaborating with my dear friend and colleague John J. Borg for over 10 years now. What made this trip different, however, was that this time I had my four month old baby with me. So this isn’t a post about fieldwork so much as a post about family and friendship, and how they make doing science as new mum possible. More than possible, in fact. The support I had from my husband, parents and colleagues made doing fieldwork with a baby in tow an absolute joy. Ghar Dalam (aka The Cave of Darkness) is — or rather, was — full of fossils of dwarf elephant, dwarf hippo and dwarf deer. Thousands of fossils have been excavated from here over the years, by loads of different people. You can visit the cave today as a tourist (it’s a bargain at €5), and see the fossils in the museum and the excavated trenches in the cave itself. We are bringing modern methods to bear on the cave sediments and stalagmites, and on the fossils themselves, to find out how, when and why these island dwarfs evolved. On previous trips we collected samples for dating. This trip was all about recording the cave in detail: cleaning and drawing stratigraphical sections, identifying and surveying the historical excavation trenches, and accurately recording key features like sample locations and nearby fossils using a total station. We had planned to do this last summer, but all the provisions needed to allow me to participate while pregnant (no heavy lifting, no clambering about over and under cave features etc) basically meant I’d be left twiddling my thumbs on the sidelines. So I had the cunning* plan of delaying until I was on maternity leave, using my ‘keeping in touch days’ to take part without violating my leave conditions. That way the project wouldn’t be delayed (especially important for our PhD student Leila D’Souza), I’d be able to hit the ground running when I returned to work (always key for a post-doc), plus we’d get to go during the low season (cheaper! quieter! cooler!). And in my gung-ho, overconfident pre-baby mind, I thought four months old would be a great time. By then I’d have being a mum down pat, right? In reality, by four months I still hadn’t had much luck with expressing breastmilk or with R taking a bottle, and after a rocky start breastfeeding the last thing I wanted to do was spend time training her to not want to nurse! On top of that, R hit the four-month clingy, sleep regression stage just as we were due to head off. My idyllic vision of R spending the day in quality bonding time with her grandparents and her daddy as they had a lovely holiday, while I worked (and pumped), crumbled. I was dreading the trip, and felt like a prize plum for having suggested it in the first place. Or rather, all the wonderful people in my life simply kept on being their usual, wonderful selves. It was only me who had imposed the stressful pumping-offsite-child-care plan. Ghar Dalam is an accessible tourist attraction. It’s a matter of minutes to leave the site, and head up the steps through the garden to John’s office. A matter of seconds to reach a bench amongst the fragrant maquise flora. Both places were perfect for feeding, and so R could simply stay nearby and be fed and cuddled whenever she needed it. My fieldwork day unfolded like this: two good feeds for R before heading to the cave for 09:30**, made totally possible by having my husband and parents around to make me breakfast while I fed her (and abandon the dishes to them!). This gave a good two to three hour window where the grandparents got their morning fix of R, while we cracked on at the cave. My husband brought R to me around lunchtime (give or take), and I sat in the dappled sun feeding her to the sound of bird song while he did a pastizzi run, and the team all stopped for lunch. Then back to the cave for more work, while my husband looked after R for the afternoon. I could hear them cooing to each other, and reading books, as I drew up sections and contemplated contacts. Or silence would fall, and I’d know she was napping in the sling cuddled close to her daddy. It was lovely. We’d finish up for the day around 16:30 in time for R’s next feed, head home to shower and hear about my parent’s afternoon of sight-seeing (they LOVED Malta’s rich history & prehistory), before meeting up with the rest of the team for dinner. R came too, of course! So while, yes, I got less done than usual as having to break for 40 minutes every 2-3 hours will have it’s impact, and I wasn’t able to work in the evenings as I normally would, the trip was a great success. I used my breastfeeding breaks to do a spot of bonus scicomm on twitter (check out the #IceAgeMalta hashtag), chatting with tourists as they came by and asked about our work, or to email & chat with project members who were back in Britain. Or I simply looked down in awe at my miracle daughter, and let that fierce heart-clenching love wash over me. I had, quite simply, a wonderful time. And I think everyone else did too. And we got all of our work done, thanks to the efforts of our superb team. Here’s why it worked out so well: privilege. I am privileged to have supportive colleagues who are also friends, who were totally behind the plan to bring the family along and who never once made me feel they begrudged R’s presence (or the time I gave her). I am privileged to have a partner who was willing (and able, thanks to generous annual leave) to take time off work to take on the bulk of the daytime childcare. I am privileged to be wealthy enough (and have parents who are wealthy enough) to cover the flights and accommodation costs of my family fieldwork entourage. With the right support, anything is possible… Feeding R in the cave, while giving instructions! The lesson here is that with a bit of child-care support in place, and flexible attitudes, anything really is possible. If we freed up funds for this, it wouldn’t just be for the privileged few. In the meantime, thank you to my fieldwork family: Adrian Glover, Julie & Ray Herridge, Adrian Lister, Leila D’Souza, Chris Standish, Neil Adams, Maggie Johansen, and Suzie Pilaar Birch. *not so very cunning. If I’d waited til my 6 months paid leave was up, I’d’ve got paid for my KIT days! **another thing that helped make this trip a success is that the working day was constrained by the cave’s opening hours — unusually civilised! 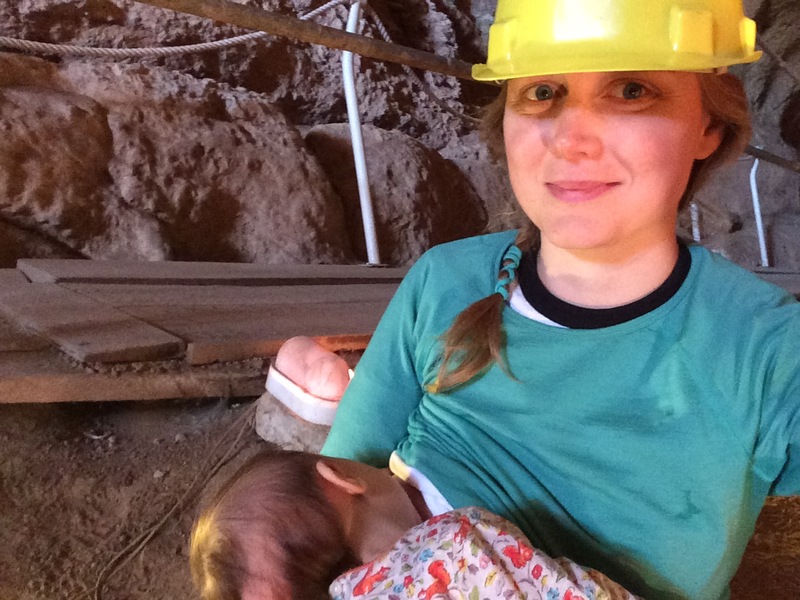 I was inspired to write this post after reading Bethan Davie’s blogpost on fieldwork while pregnant. You should check that out too, and share your own experiences on the comment threads there and here!